This dish is inspired by a recipe that one of my colleagues gave me. I’m not sure where she got it from. I love the combination of flavours and textures (and we already know about the colours!) It needs little seasoning, except for some good quality sea salt. It makes a fabulous side to your favourite meat or vegetarian main. I have even eaten it for lunch with a nice crusty bun and some churned butter!! Place sliced yams and apples in a medium bowl and drizzle with olive oil. Toss until all pieces are lightly coated with the oil. Place on a parchment lined baking sheet and sprinkle with salt. Place in oven. After 15 minutes check to see if the apples are cooked. They will be done before the yams. Remove the cooked apples and place the yams back in the oven for another 5 – 10 minutes until the yams are tender, but not mushy. In the meantime, heat 1 tablespoon olive oil in a skillet and sauté the onions until they begin to caramelize. Sprinkle with salt. Wash the kale and remove the thick centre stalk. Shred into small bite-size pieces. Once the onions are done, place the kale in the skillet with the onions. Add 1 tablespoon water and sauté a few minutes until the kale turns bright green. Sprinkle with a bit of salt and pepper and remove from the skillet. 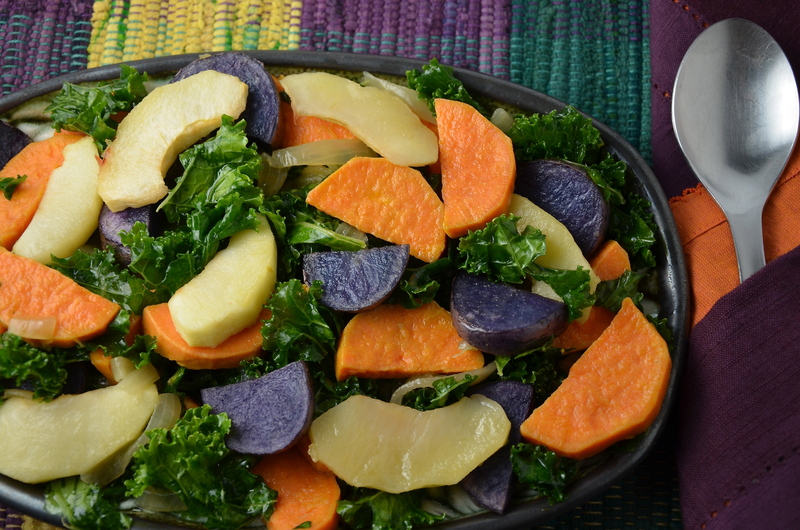 Combine the yam mixture and the onion-kale mixture in a medium bowl and toss lightly. Serve as a side to any meat or vegetarian main. Enjoy your colourful dish beside linens that match the food! LOL!! Awesome! Glad to know that I’m not the only one! Maybe there should be a little warning posted before we sign up for the blog; Warning: You may become susceptible to a mysterious blogging syndrome, marked by obsessive colour coordinating 🙂 Too funny! Yes! You can get very caught up colour-coordinating. I’ve done it before with yellow tomatoes and even those orangey-coloured beets (which Ive yet to find). Looks great! Oh good! I’m so glad it’s not just me!! Hmmm, yes I have noticed those beets too 🙂 Well, maybe I’ll have to start dreaming up some lovely colour coordinated dishes with them as well!! Thanks so much for taking the time to comment! 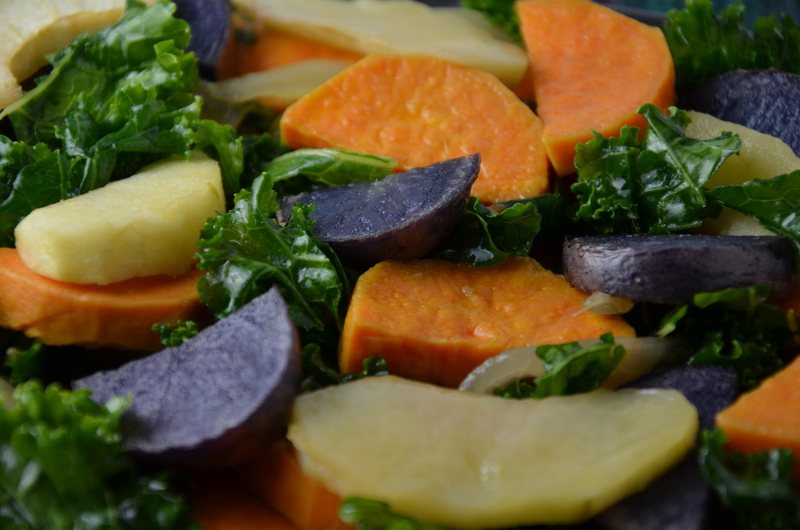 Purple yam, apple and kale…what a great combination. I love this. Thanks for sharing! You are so very welcome! I’m glad you like the idea of it and hope you get the chance to make it. It’s pretty quick and easy to make! LOL, I know of what you speak, being a foodie myself. 😉 I love purple potatoes of both types, gorgeous color and taste great too. Hey Geraldine, great idea about the kids and the coloured veggies! Wow, I’m thinking purple and orange yam (potato) oven fries! !I’ll pass the idea on to friends and family with kids…Have a wonderful weekend!